On the September 11, 2016 ceremony President Barack Obama remembered and honoured the victims of terrorism. However, what was the position of Obama when he visited the Moneda in 2011? Chile was the second leg (after Brazil) of Obama’s March 2011 trip to Latin America. For the vast majority of people in Latin America, as well as many in North America and Europe, Chile invokes the atrocious event of September 11, 1973: the U.S.-organized military coup d’état. It was directed against the democratically elected socialist government of Salvador Allende. Resulting from the coup, tens of thousands of people were imprisoned, tortured, killed, forced into exile or disappeared. All left-wing socialist and communist organizations were violently suppressed. Allende, one of the icons of Latin American socialist and revolutionary personalities, himself died on that day in the Moneda Palace (government building). It is important for people to reflect seriously upon Obama’s manipulation of history and political content that is embedded in his use of the past. Together, they form the manner in which Obama and the U.S.-type of multi-party, competitive democracy use selective history with the goal of distancing themselves (in the case of Obama) from the previous administrations and, indeed, the entire history of U.S. military interventions in the hemisphere. This process is carried out in order to provide a “new face” to U.S. intrusion. This course of action even goes so far as to co-opt opposition to the decades-long U.S. policy so that this resistance applauds the new U.S. image under Obama. He goes to the Moneda, where the U.S. was responsible for the death of Allende. Obama uses the hostility against the U.S.-organized coup and the pro-Allende sentiment. He does so by attempting to convert the resentment in favour of the U.S. by giving the impression that Washington is turning the page on its aggressive interference and thus the Chilean people can rely on him. We recall, as mentioned above, Obama’s comment in his second book regarding his frustration about progressives and the left standing up against the coup in Chile. He juxtaposed this progressive political tendency to repression behind the Iron Curtain. Obama’s view on the Iron Curtain versus Chile reflects a very important traditional stance of U.S.-foreign policy. Irrespective of what opinion one has about the former U.S.S.R. and Eastern Europe of the 1970s and 1980s, what has been the age-long policy of the U.S. since the 1917 October Revolution? The course of action has been to support anything that opposes socialist, progressive and revolutionary ideas and actions. Taking the twentieth century alone, there was the initial support for the fascists in Germany and Italy leading up to World War II (because it had in its cross hairs the U.S.S.R.). There were also the innumerable, bloody undertakings in Latin America throughout the century (El Salvador, Guatemala, Cuba, Nicaragua, Brazil, Grenada, etc.). It is well known with whom the U.S. has always sided and against which forces it fought. Bachelet’s ratings have been affected by recent demands for pension system reform and massive student protests for free education.The approval rating of Chile’s president, Michelle Bachelet, is at its lowest level ever with only 19 percent of those surveyed saying they support her, according to a poll published on Friday. According to the consulting firm Adimark, this is the lowest rate during her two terms in office. The head of state has been affected by big protests to reform the pension system in the country, as well as marches by students to demand free higher education, according to the survey. Bachelet is carrying out several reforms to change the educational system in the country, the tax system and the constitution, all inherited from the dictatorship of Augusto Pinochet. The survey, which is taken monthly to assess Bachelet's government since her first term in 2006, also indicated a significant drop in popularity for the Chilean government as a whole. According to the firm, the decline in approval is more dramatic among middle- and lower-income voters. Citizens were also asked who they would prefer to be the next president. Eighteen percent said they would vote for former president Sebastian Pinera, 5 percent said former president Ricardo Lagos and 5 percent said Senator Alejandro Guillier. Meanwhile, 47 percent expressed no preference. Friday’s survey was conducted between Aug. 9 and 26, and included 79,000 telephone interviews with those age 18 and older. The organization “Chile is Better Without the TPP” which gathers more than 100 social, environmental, unionist and political organizations united to defend the right to Freedom of Speech, have joined the worldwide campaign for the freedom of the Australian cyber activist, Julian Assange. Last July was the 4-year anniversary since the founder and director of Wikileaks exiled to the Ecuadorian Embassy, where he has lived ever since in order to avoid being detained, transported to Sweden and extradited to the US. In February 2016, a team belonging to the United Nations Working Group on Arbitrary Detentions absolved Assange after analyzing the case, which has no ongoing trial. This is related to the accusations of sexual assault that Assange denies. The States involved have not fulfilled the order. Sweden has refused to question Assange in their Embassy, which a procedure that has been used in other cases. According to Wikileaks this is related to an armed maneuver by the US to punish the cyber activist for sharing the truth about the tortures carried out by the US Army to their prisoners in Abu Ghraib, Iraq, as well as the true nature of the TPP, the TTIP and the TISA, among other secretes of the North American country. As we all know, in Chile the TPP only became known to the public in November 2015 when the negotiation had already concluded. It was only because of Wikileaks that in 2013 the citizens learned for the first time about the chapter regarding “Intellectual Property”. Thanks to this, citizens knew it was important for the negotiations not to be carried behind their backs. Today, the reasons why governments have hidden the serious impacts of this treaty are clearer than ever and the task of organizing ourselves to stop the signing of the TPP is urgent. Demanding Julian Assange’s freedom is a claim consistent with our own struggle to demand the end of secrecy and that treaties such as TISA are never again negotiated behind the backs of the people and social organizations. Julian Assange has recently participated in a debate via livestreaming on the 60th Anniversary of Chile’s Journalism School, which is a member of the “Chile is Better Without the TPP” organization. There, Assange warned against the TPP and explained how this treaty codifies the laws of intellectual property to manipulate them so that they enable control of information and monopoly of labels by the internet and transnational companies, at a global scale, obstructing the independent investigation and promoting companies’ espionage to people by the large powers. He also affirmed that the TPP, the TTIP and the TISA involve different areas of the world but exclude China and other countries of the BRIC (India and Brazil), generating a strategic triangle that seeks to create a new legal regime of global operation, much more powerful than just military power. “Chile is Better Without the TPP” has united in one voice the cry of communicators, human rights, legal, union and social organizations of Latin America and the world to demand Julian Assange’s freedom. De acuerdo a los organizadores, en todo el país se sumaron más de un millón de personas en las protestas que se realizaron en un total de 50 ciudades. 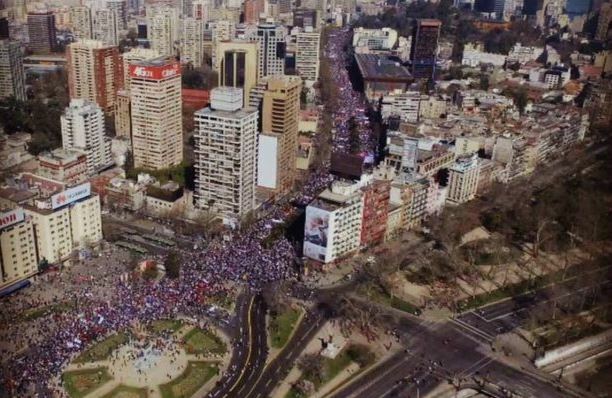 Parecía la típica postal del Maratón de Santiago, pero no, la imagen de la capital vista desde los cielos daba cuenta de la gran cantidad de personas que acudió este domingo a la marcha “No+AFP”. Si bien aún no hay un catastro oficial, se presume que el número de adherentes superó los 150 mil del 24 de julio. En la capital, la convocatoria partió en la Plaza Italia y culminó en el sector de Los Héroes. Tal como se puede ver claramente en la fotografía que acompaña este texto, la columna de gente partía en Plaza Baquedano y se perdía por la Alameda hacia el poniente, o dicho de otro modo, los primeros iban bastante adentrados en la avenida Libertador Bernardo O’Higgins, pasado el cerro Santa Lucía, mientras lo últimos daban inicio al largo transitar de la protesta. Tras la movilización, los convocantes llamaron a un paro nacional para el 4 de noviembre, en caso de que las autoridades no atiendan sus demandas. La Intendencia Metropolitana autorizó la nueva movilización en contra de las actuales administradores del Sistema de Pensiones convocada por la coordinadora “No+AFP” para este domingo 21 de agosto. El intendente Claudio Orrego sostuvo este miércoles que el motivo para la autorización fue el buen comportamiento que hubo en la marcha pasada del 24 de julio donde, según el movimiento, más de 750.000 personas salieron a las calles del país. La autoridad metropolitana solicitó que esa conducta se reitere y que sea una marcha familiar. Mientras que la coordinadora espera superar la convocatoria pasada, con manifestaciones en distintos sectores del país. La misma agrupación había convocado el miércoles pasado a un cacerolazo para exigir un cambio al sistema previsional chileno en medio del debate por las bajas pensiones. Este domingo a lo largo de todo Chile, miles de familias marcharon en contra del sistema AFP que funciona con capitalización individual, y no con sistema de reparto como en gran parte del mundo. Esto ha resultado en que el 91% de los jubilados reciba en promedio $156 mil, alrededor de $100 mil menos que el sueldo mínimo. Por otra parte, los dueños de las AFPs y sus expertos nos invitan a que coticemos un mayor porcentaje de nuestro sueldo o que trabajemos más años para llegar a una mejor jubilación. Este sistema no corre para las Fuerzas Armadas, Gendarmería ni Carabineros. Previo a la Marcha, las organizaciones convocantes citaron a los grandes medios -pues ya había expectación en las redes sociales y medios alternativos- para hablar sobre lo que sería la marcha, sus argumentos y los puntos de encuentros (más de 40 convocatorias a lo largo de Chile). Sin embargo a la conferencia solo llegó uno de esos medios (Radio BioBío), y así manifestaron su molestia los convocantes apuntando a la relación que hay entre los grandes medios de comunicación y las AFP.A pesar de esto, este domingo en más de 30 ciudades y localidades de Chile hubo movilizaciones, entre ellas, Santiago, que convocó a más de 180 mil personas y se estima que en todo Chile marcharon en total unas 750.000 personas. Se marchó en ciudades como Valparaíso, Concepción, Coyhaique, Arica, Punta Arenas, Iquique, Atacama (Observatorio Astronómico ALMA), Antofagasta, Copiapó, Rancagua, Chillán, Los Ángeles, Talca, Rengo, San Bernardo, Santa Cruz (VI), entre varias otras ciudades y localidades a lo largo del país. Este domingo 24 de julio, diversas organizaciones sociales saldrán a la calle en una marcha convocada para exigir a las autoridades el fin del actual sistema previsional. La movilización, que tendrá un carácter familiar, se sustenta en las exiguas pensiones que entregan las AFP comparadas con las millonarias ganancias que obtienen dichas empresas. “El sistema de AFP no da para más”. Esa es una de las conclusiones de las organizaciones que convocan a una marcha familiar, a nivel nacional, en contra del actual sistema previsional y que se da en el contexto de una serie de críticas y llamados a modificar este régimen ideado e impuesto durante la dictadura de Augusto Pinochet.Esto debido a que la paciencia de los trabajadores se agota al ver cómo día a día los montos de las pensiones se reducen siendo, en muchos casos, inferiores al sueldo mínimo, eso sin mencionar la fragilidad del sistema que depende de los vaivenes internacionales del mercado y lo precario que es comparado con el régimen que rige a las Fuerzas Armadas que se mantienen bajo el sistema de reparto solidario. De acuerdo a datos de Fundación Sol, el sistema de ahorro privado forzoso (capitalización individual) actualmente paga un millón 120 mil pensiones de vejez, invalidez y sobrevivencia, cuyo monto promedio apenas es de 205 mil pesos y con el aporte previsional solidario del Estado llega a 219 mil pesos. En particular, si consideramos las 336 mil pensiones de Vejez Edad que pagan las AFP –retiro programado–, el 91 por ciento se encuentra “por debajo” de los 156 mil pesos, lo que equivale al 62 por ciento del salario mínimo nacional. Por lo mismo, diversas organizaciones sociales han convocado a una marcha familiar para este día domingo, que se desarrollará de forma paralela en gran parte del territorio nacional y que se proyecta hacia el futuro, tal como lo sostiene el presidente de la Confederación de Funcionarios de la Salud Municipalizada (Confusam), Esteban Maturana. “Esta marcha familiar para nosotros es un paso más hacia un camino mayor y eso significa convocar a un paro nacional productivo que vaya directamente a donde más le duele a los empresarios dueños de las AFP”, afirmó Maturana. La movilización cuenta además con el respaldo de los estudiantes universitarios, quienes se han sumado considerando la relación que se quiere establecer con el sector laboral, como afirma el vocero de la Confech, Gabriel Iturra: “Entendemos que no sólo la lucha por la educación es un elemento importante sino que considerar jubilaciones dignas también, sobre todo que existe un sistema segregador como las AFP”. Por su parte, el Jefe de Estudios de la Subsecretaría de Previsión Social, Gonzalo Cid, explicó que en sistemas económicos con precaria legislación laboral, los países tienden en avanzar hacia un sistema mixto de previsión: “La mayoría de los países del mundo tienen sistemas mixtos, la norma es a tender a privilegiar un sistema, que generalmente es el de reparto, y otorgar la alternativa de uno de capitalización individual”. Dentro de las ciudades que serán parte de esta convocatoria está Valparaíso, cuya marcha ya fue autorizada por la gobernación provincial. También participarán de la movilización Arica, Calama, Antofagasta, La Serena, Rancagua, Talca, Concepción, Temuco, Osorno, Coyhaique, Punta Arenas, entre otras. Todas las marchas comenzarán a las 11 de la mañana. En el caso de Santiago, el punto de encuentro será en el sector de Plaza Italia. Sólo en Puerto Natales la convocatoria comenzará un poco más tarde, alrededor de las 15 horas. El sistema a futuroNuevamente recurriendo a los datos de la Fundación Sol, el 72 por ciento de los afiliados que tienen entre 60 y 65 años acumula menos de 30 millones de pesos en su cuenta individual, por tanto, pueden autofinanciar a la fecha pensiones “menores” a 150 mil pesos mensuales. A esto se agrega que la Comisión creada por la Presidenta Michelle Bachelet, que estudió el sistema de pensiones, la llamada Comisión Bravo, calculó que la mitad de las personas que jubilen entre 2025 y 2035 y que hayan cotizado entre 25 y 33 años exclusivamente en las AFP, tendrán una tasa de reemplazo menor a 22 por ciento. Esto quiere decir que si un cotizante, en los últimos 10 años de su vida laboral, registraba una remuneración imponible de 500 mil pesos, solo podrá autofinanciar una pensión “menor” a 110 mil pesos. Para los defensores de este sistema, el problema de estas pensiones radica no en las AFP, sino que en los bajos sueldos que perciben los trabajadores. Esta realidad se condice con lo expresado por las Administradoras de Fondos de Pensiones, quienes sostienen que el 70 por ciento de las pensiones que pagan se explica por la rentabilidad que generan a través de su política de inversiones. Esto quiere decir que, sin esa rentabilidad, el 91 por ciento de las pensiones de Vejez Edad en Chile sería menor a 47 mil pesos. ¿Quién gana con este negocio?Tomando en cuenta todos estos antecedentes, la única respuesta posible es que el sistema está diseñado para generar ingresos multimillonarios a sus controladores. A pesar de los bajos salarios, las lagunas y la baja de tasa de cotización, el año 2014 las AFP registraron ingresos por 7,1 “billones” (millones de millones) de pesos, por concepto de cotizaciones de trabajadores principalmente y, en menor medida, por aportes del fisco para mejorar las bajas pensiones. En el mismo año, se registró un gasto de 2,8 “billones” de pesos para pagar pensiones. Los números son aún más escandalosos si se toman en cuenta los datos desde que comenzó a regir este sistema, el acumulado indica que han ingresado a las arcas de las AFP 90 “billones” mientras que se han gastado en pensiones 30 “billones”. Esto se traduce en que si Chile hubiese tenido un sistema de reparto en este período, las pensiones pagadas al menos podrían haber sido el doble, quedando un importante excedente generando rentabilidad en un fondo de reserva de pensiones. Pero no sólo las administradoras ganan con este sistema, actualmente, las AFP invierten más de 31 mil millones de dólares en 10 Bancos que operan en Chile. De esta forma, los trabajadores chilenos, a través de sus cotizaciones, terminan financiando a los bancos de los grupos Luksic, Matte, Yarur, Saieh o a grupos multinacionales. A esto hay que agregar que esos mismos trabajadores, cuando piden un crédito de consumo a estos bancos, deben pagar tasas de interés anuales que pueden superar el 20, 30 e incluso el 40 por ciento. En territorio mapuche, los terratenientes han anunciado el uso de las armas para combatir los ataques que han sido objeto. Una situación que pone en jaque cualquier intención de diálogo y solución política a un conflicto que amenaza con encender una llama de violencia difícil de apagar. “Paz en la Araucanía” rezan diversos afiches instalados por latifundistas y empresarios en los caminos, campos y ciudades la Región de la Araucanía. No obstante, algunos de ellos hace pocos días, han declarado que de ser necesario, estarán dispuestos a emplear las armas para defenderse de los posibles ataques que sus terrenos y propiedades puedan ser objeto. En el contexto de una instancia de diálogo entre el Gobierno y algunos actores del pueblo mapuche, los dichos de los empresarios vienen a aumentar la tensión en un territorio que es escenario de constantes enfrentamientos entre desconocidos y agricultores. Todo esto, a propósito de la férrea defensa por parte de los propietarios de los terrenos frente a las reivindicaciones por las tierras ancestrales del pueblo mapuche, usurpadas con la venia del Estado chileno. La situación no sólo llama la atención por conminar explícitamente al empleo de la violencia, justificado según ellos por la “legítima defensa”, sino también por las consecuencias de los potenciales actos que pueden ocurrir bajo la consigna de autoprotección que impulsan los latifundistas, la cual podría dejar nuevas víctimas fatales y un quiebre total en las relaciones entre Chile y el pueblo mapuche. El abogado y observador del proceso constituyente Salvador Millaleo criticó la imprudencia de estas declaraciones, e indica que estos actos lesionan el Estado de derecho y entrampan las iniciativas de diálogo. “Si ellos entienden que pueden demotu proprio determinar cuándo una agresión es ilegítima, cuándo algo es una ofensa para ellos y actuar con vías de hecho de violencia, es algo que amenaza el Estado de derecho y los sitúa a ellos por sobre la democracia y la ley y es algo que deben revisar”, dijo Millaleo. En la misma línea, el diputado René Saffirio (IND) manifestó su preocupación: “Parece poco razonable que mientras se hacen intentos, aunque frágiles, de encontrar puntos de diálogo para avanzar en los niveles de conflictividad en la Araucanía, puedan sostener una postura de esa naturaleza, porque eso nos lleva irremediablemente a una situación de confrontación, cuyos resultados son imposibles de prever, pero que nada bueno pueden traer a la Araucanía”, indicó el parlamentario. Por su parte, el diputado Germán Becker (RN) dijo que la situación es preocupante, pero entendible frente a ataques “donde les vengan a quemar la casa o disparar” a los empresarios y sus familias. Advierte que “las policías no han tenido la suficiente capacidad o inteligencia para poder anticiparse a los hechos”, agregando que hay mucho trabajo por hacer al respecto. La determinación no sólo levanta críticas, sino también motiva a diversas personas a poner sobre la mesa formas de poder resolver esta situación. Sobre todo, si a la par con estos anuncios, existen denuncias de las comunidades mapuche acerca de grupos armados, convocados por terratenientes y algunos empresarios para hacer justicia en sus términos con manos propias. René Saffirio indicó al respecto que si se quiere encontrar solución a un conflicto que es político, deben concentrarse los esfuerzos en eso y no responder con más violencia que sólo llevará más daño y dolor a la región. Salvador Millaleo, por su parte, dice que la situación se agrava en la medida que los empresarios no han empatizado con la situación del pueblo mapuche. “(La situación de incertidumbre) es reforzada por la incomprensión que tienen los empresarios de lo que están pidiendo los pueblos indígenas. Esto no se resuelve por una vía de orden y seguridad, sino que básicamente se resuelve con un diálogo donde se reconozcan los derechos de los pueblos indígenas”, expresó el abogado. Las distintas visiones coinciden en la ineficacia que han tenido los distintos gobiernos en llevar adelante los procesos de diálogo para dar fin a los episodios violentos en la región, apreciación que también comparten los empresarios. José Araya, coordinador del Programa Ciudadanía e Interculturalidad del Observatorio Ciudadano, acota que estos episodios se dan debido a la usurpación de los terrenos mapuche, sobre los cuales los terratenientes quieren ejercer derechos adquiridos de forma colonizadora y violenta a través del tiempo y sobre los cuales se sienten con atribución de defender. Respecto del rol de las autoridades, Araya enfatiza que urge entablar un diálogo político y señala que “lo que cabe esperar es que tengamos autoridades con competencia en el tema, conscientes de la situación que está ocurriendo y que opten por este diálogo político. En la medida que nosotros tenemos autoridades incapaces de hacerse cargo del tema, una ausencia de una política pública efectiva para hacerse cargo de los derechos ancestrales del pueblo mapuche, siempre va a haber un margen para que personas opten por esta vía de la violencia extrema y el uso de las armas para asegurar su derecho”. Sin embargo, no existe un total convencimiento que la actual mesa de diálogo vaya en la dirección adecuada. Al menos así lo estima el ex intendente de la Araucanía Francisco Huenchumilla. En conversación con Radio y Diario Universidad de Chile dijo que “se echa de menos que algún ministro del comité político integre la mesa para que los distintos sectores crean que va en serio y no es solo un lavado de manos del gobierno”, arguyendo que la falta de un alto personero político del gobierno le resta seriedad a la iniciativa, que además no quedan claros los objetivos y que los plazos políticos están vencidos debido a la proximidad de los períodos electorales. Se configura, de esta forma, un cúmulo de tareas pendientes que hoy amenazan con traer a la pauta hechos de violencia en nombre de una defensa cuya legitimidad se difumina en un manto de dudas. Bajo fuertes medidas de seguridad por tierra, aire y mar, mandatarios de Perú, México, Colombia y Chile, se reúnen en la localidad de Puerto Varas, Provincia de Llanquihue, Región de los Lagos en el centro sur de Chile (Territorio ancestral Mapuche Williche). A partir de este jueves comienza la XI Cumbre de la Alianza del Pacífico, tendiente a establecer acuerdos comerciales y contará con la presencia de la presidenta chilena Michelle Bachelet, y los mandatarios de Perú, Ollanta Humala; México, Enrique Peña Nieto; y Colombia, Juan Manuel Santos. Por Perú también asistirá el presidente electo Pedro Pablo Kuczynski; y como observador, el Presidente neoliberal argentino: Mauricio Macri. Cabe señalar que el Presidente Peña Nieto llega a Chile luego de una violenta represión y asesinatos a sectores de la educación mexicana, incluyendo a profesores de Oaxaca, sumándose este hecho a las sistemáticas masacres estatales que encabeza el mandatario mientras los intentos de privatización y explotación a favor del lucro para ciertos grupos de poder económico continúan en aumento, hechos por los cuales se le ha sindicado de genocida. Por su parte, el presidente colombiano Juan Manuel Santos, acude a la cumbre luego de un acuerdo de Paz por el denominado conflicto armado con Las Farc, sin embargo, existen serios cuestionamientos a su gestión por las constantes transgresiones a los derechos de los Pueblos Indígenas en este País, donde aún persisten graves hechos de violencia estatal y de grupos privados, existiendo serios conflictos a causa de la industria extractivista como ocurre en el Cauca y otros territorios ancestrales en el País. En el año 2014 se contabilizaron 25 asesinatos a defensores de los territorios, incluyendo a varios miembros de Pueblos indígenas. Cabe recordar que Santos dirigió las fuerzas armadas colombianas hasta mayo de 2009. En ese período afloró el escándalo de los “Falsos positivos”, civiles asesinados por el ejército cuyos cuerpos fueron contabilizados como bajas en combate de la guerrilla, por las cuales se entregaban recompensas a los militares responsables de su abatimiento. El gobierno de Bachelet ha intensificado el conflicto con el Pueblo Mapuche, ampliando las unidades represivas de la policía militarizada, volviendo a la aplicación de la Ley Antiterrorista, ampliándola a la Región de los Ríos (Lanco) contra comunidades y a favor de la empresa forestal Arauco, registrándose recientemente un hecho de secuestro y amedrentamiento por algunas horas a una autoridad tradicional Mapuche en Temucuicui, mientras continúa dando luz verde a una serie de proyectos industriales en desmedro del territorio ancestral. El presidente Humala de Perú deja pronto su cargo y continúa Pablo Kuczynski, otro neoliberal, quien tuvo que ganar en segunda vuelta a Keiko Fujimori, hija del genocida ex Presidente Alberto Fujimori. Humala ha sido acusado de traicionar el compromiso político que había asumido previo a su gestión y de actuar a favor del extractivismo neoliberal, provocando diversos hechos de violencia, incluyendo casos de asesinatos de miembros de comunidades de Pueblos Indígenas y sectores campesinos a través de agentes policiales. La organización de esta denominada Cumbre Alianza del Pacífico estima que: “Es responsable del 51,4% del comercio de América Latina y que la Alianza del Pacífico se constituyó en abril de 2011 en Chile con la idea de impulsar el comercio regional principalmente con los países asiáticos. Se espera que en la próxima década, el bloque se constituya en la cuarta economía que más contribuya al crecimiento mundial”, indican. Trascendió que la semana pasada, en Santiago, se llevó a cabo una primera rueda de negocios de la Alianza del Pacífico, en la que se concretaron acuerdos por 200 millones de dólares relaciones e iniciativas de comercio empresarial. De estos mandatarios, tres han firmado el Tratado transpacífico TPP (México, Perú y Chile), un sistema o régimen de comercio supraestatales a favor del interés transnacional, encabezado por el sector empresarial vinculado a Estados Unidos, considerado un atentado a derechos humanos y contra las soberanías de los países y que debe entrar en discusión en los Congresos. En sus 30 capítulos, el acuerdo regula un gran número de temáticas, que van desde el comercio de lácteos, hasta la regulación laboral, pasando por derechos de autor, patentes, inversiones estatales, medio ambiente, obtentores vegetales, hasta la competencia de tribunales internacionales a favor de transnacionales. En el TPP han participado gobiernos y empresas de: Australia, Brunei, Darussalam, Canadá, Chile, Estados Unidos, Japón, Malasia, México, Nueva Zelandia, Perú, Singapur y Vietnam, quienes mantuvieron en secreto el proceso de negociación hasta hace algunos meses donde se liberó el acuerdo en el marco de su suscripción oficial. “Desafíos del Movimiento Estudiantil: entre los cambios estructurales, la marginación de los pueblos ancestrales y el Pueblo Mapuche”, es el documento compartido desde comunicaciones de la Federación Mapuche de Estudiantes (FEMAE) suscrito además por diversas organizaciones de estudiantes Mapuche. ​Taiñ fütakeche feypikey: kuifi mew Wallmapu mew tachi kom mapuzugulerkefuy, welu chumull ga akulu ta pu wigka, pataka küla mari xipantu getuy kechanentufuygün inchiñ ñi pu fütakecheyem. Fey mew fantepu pu wekeche kimnekepaiñ kimün taiñ chegeal, igkamekepaiñ taiñ mapu, feymu wiñowixamaiñ tachi zugu mu taiñ kizugeneal, taiñ mapuche gen mogeleal. En los últimos años estudiantes, dirigentes y federaciones agrupados en la CONFECH han venido discutiendo sobre diversos puntos en torno a la Educación chilena. De estas discusiones han emergido propuestas en torno a la gratuidad y financiamiento de la educación, su marco regulatorio, el tipo de educación, entre otros. Las actuales demandas, son reconocidas y compartidas por la gran mayoría de los estudiantes, además de ser representativas, pues estas han sido escogidas y validadas desde las bases estudiantiles, contando con la legitimidad de la ciudadanía. En este contexto, compartimos los anteriores puntos que apuntan a la necesidad de una profunda transformación y reforma de tipo estructural, proceso que ha sido voluntad del movimiento estudiantil en cuanto a la puesta en escena de esta temática y tomada con posterioridad por las cúpulas dirigentes y partidos políticos tradicionales de tendencia neoliberal. Sin embargo, no podemos dejar de señalar la permanente omisión de nuestras demandas como estudiantes pertenecientes a los llamados pueblos indígenas. Esta situación no es casualidad y probablemente se siga tropezando con la misma piedra en la medida que se reproduzca el modelo colonial y se siga viendo el tema indígena como ajeno a la realidad social actual. Se evidencia así el fiel reflejo de la política chilena de exclusión y homogeneización, herencia decimonónica del proyecto de Estado-nación que ha calado profundo, incluso en las clases populares. En consecuencia, no se ha hecho una mínima mención y consideración de lo que ocurre con el derecho a la educación propia y con pertinencia cultural, derecho que reivindicamos como estudiantes sujetos de las naciones ancestrales, preexistentes a la sociedad hispano-criolla. El ocultamiento de la “Otredad”, tiende a ser violenta toda vez que obliga a infantes, niños y jóvenes a incorporarse tempranamente a las pautas de la sociedad dominante, dominio que por lo ya señalado ha sido colonizante y agresivo, imponiendo una epistemología y en consecuencia adoptando una identidad ajena. El miopismo homogeneizador no ha permitido ver más allá del discurso unitario y central, repercutiendo de manera cotidiana y sutil en las prácticas de nuestros pares estudiantiles. De ahí, que es imperioso proponer como movimiento estudiantil, una sociedad que transforme el carácter etnocentrista, discriminador, racista y de orden clasista que ha sido incapaz de reconocer la diversidad y riqueza cultural que no tan solo intentan dominar a los pueblos ancestrales, sino a la sociedad en su conjunto. Es por ello, que debemos actuar de forma conjunta y encarar al Estado de Chile, particularmente al Ministerio de Educación (MINEDUC), cuya desaprobación según la encuesta Adimark (Mayo, 2016) a su máxima funcionaria la Ministra de Estado Adriana Delpiano, señala que “La Educación por su parte también retrocede 4 unidades, llegando al 30% de aprobación… (mientras que) un 49% declara estar de acuerdo con la Reforma Educacional, disminuyendo 1 punto en relación al mes anterior”. Por otra parte, el manejo del tema Mapuche cuenta con un 82% de rechazo, sumando a esto los últimos dichos del representante designado del gobierno central, Intendente de La Araucanía Sr. Andrés Jouannet, desconociendo las reivindicaciones del Pueblo Mapuche y utilizando discursivamente otras como el proceso, cerrado y excluyente, de Oficialización del Mapuzugun encabezado por los “especialistas” del tema indígena. Mientras en el contexto estudiantil, y a diez años de la llamada Revolución Pingüina, donde muchos de nosotras(os) participamos de manera activa, podemos señalar desde nuestra experiencia como testigos, que las demandas de las(os) estudiantes indígenas no han sido abordados con la profundidad que amerita el asunto. Conscientes de este contexto,han sido diversos pueblos indígenas (Mapuche, Rapa Nui, Aymara, Quechua, Likan Antay, Kaweshkar) los que se han manifestado en pos de la construcción de su propia educación, demandas y propuestas que no han hecho eco, y por ende no han sido consideradas en los puntos presentados en la última plenaria de Confech del pasado 28 de Mayo. Bajo la noción de transformar la sociedad, es que se necesita de importantes cambios en los espacios cotidianos, institucionales y educativos lo que necesariamente nos lleva a manifestar nuestra inquietud frente a la omisión de demandas conocidas por las dirigencias de Confech y que no han sido tema en los masivos de difusión. Este tipo de descuidos deben servirnos para comenzar a comprender la sutileza de las relaciones que históricamente han sido asimétricas. Es por ello, y en un ánimo de comprensión y respeto, que se hace necesario repetir los puntos que hemos consensuado como Mapuche estudiantes a lo largo de cinco años en xawvn, encuentros, ngütram, foros, congresos, internados lingüísticos, asambleas en distintos espacios y territorios de Wallmapu y Chilemapu respectivamente. a) La creación de universidad Mapuche que se manifiesta como un proyecto inclusivo, de administración Mapuche, enfocada a jóvenes habitantes de Wallmapu bajo la lógica del Mapuzugun, Mapuche kimün y la diversidad epistémica en un diálogo real y en contexto. b) Enseñanza del Mapuzugun como idioma oficial e implementación en instituciones de Educación Superior que se encuentren en Wallmapu y en aquellas zonas que sean requeridas. c) Implementación de políticas de reparación lingüísticas, que se traduce en financiamiento y creación de centros para Internados de Inmersión Lingüística para la revitalización del Mapuzugun. Proceso y propuesta comenzado por la Federación Mapuche de estudiantes desde el 2014 a la fecha. d) Formación pluricultural y plurilingüe en todas las instituciones educativas, entendiendo que cada territorio e identidad ancestral debe hacerse cargo de guiar e implementar el proceso. Basado en lo anterior, yace la necesidad de articular un nuevo sistema que permita dar solución a las problemáticas sociales y regionales por medio de las universidades como herramientas a disposición de sus comunidades. Por lo tanto, hacemos el llamado a discutir en torno a este tipo de problemáticas, atingentes en el contexto de lo que se ha denominado cambios estructurales en el sistema educativo, poniendo sobre la mesa la construcción de una visión y sociedad plurinacional, pluricultural y plurilingüística. De este modo se podrá comenzar a comprender y emprender esos cambios estructurales que se anhelan. Durante la mañana de este martes 24 de mayo estudiantes de la Universidad de Concepción realizaron una marcha por el recinto hasta Rectoría donde emplazaron a Sergio Lavanchy, máxima autoridad universitaria a que se manifieste en contra del ingreso de FFEE de Carabineros al campus, donde se han registrado disparos de balines y lacrimógenas al cuerpo de los universitarios. En conversación con Resumen, Javier Arroyo, de la Vocalía de DDHH de la Federación de Estudiantes de la Universidad de Concepción explicó las razones de la movilización “Nace de los mismos estudiantes y las mismas estudiantes de la Universidad por el ingreso que realiza FFEE al campus después de las marchas. Frente a eso en el Consejo General de Estudiantes se decide que hay que realizar un tipo de emplazamiento a Rectoría, precisamente a Sergio Lavanchy para que tome posición por si está de acuerdo o en desacuerdo” y añade “esperamos que se pronuncie ya que entendemos que existe una legalidad sobre el tema: ellos pueden ingresar cuando hay un delito flagrante. Pero si no lo hay y el Rector se opone podemos tomar acciones legales por el tema: buscamos que Lavanchy se ponga los pantalones y tome posición sobre el ingreso de FFEE”. Piden desclasificación de 20.000 documentos relativos a esta materia. Los querellantes, hijos de detenidos desaparecidos de la dictadura de Pinochet y actualmente exiliados en Israel, exigen que el Estado judío desclasifique cerca de 20 mil documentos sobre la venta de armas a la dictadura genocida de Pinochet. Dos hijos de víctimas de la dictadura militar chilena y exiliados en Israel han demandado a través de una querella al Estado de Israel que desclasifique cerca de 20.000 documentos relativos a la venta de armas al régimen de Pinochet. La primera vista del proceso judicial tendrá lugar el próximo 18 de abril en el Tribunal del Distrito de Tel Aviv, y los querellantes pretenden conocer aquellos documentos relativos a la relación bilateral y comercial entre los dos países, así como posibles indicios sobre la suerte que corrieron sus progenitores asesinados tras el golpe militar del general Pinochet. También buscan que se abra un debate político en Israel sobre la venta de armamento, que lleve a regularizar dicha actividad y se prohíba su venta a regímenes dictatoriales o estados u organizaciones que vulneren los derechos humanos. “Con nuestra querella demandamos al Estado de Israel y específicamente al Ministerio de Defensa, para que de a conocer unos 19.000 documentos sobre la venta de armas y consejería de guerra entre Chile e Israel en los años de la dictadura”, explicó a Efe Daniel Silberman, hijo de David Silberman, detenido en 1973 y desaparecido desde 1974. Carta de 17 Lov y Comunidades en Resistencia sobre el actual Estado de Excepción sin decreto oficial en Wallmapu. El territorio ya está militarizado, sin que se haya firmado un decreto de Estado de Excepción. Helicópteros del Ejército de Chile sobrevuelan los fundos de Mininco y vehículos blindados de guerra del GOPE recorren los caminos de nuestras comunidades. Las Fuerzas del GOPE son una fuerza militar de Carabineros de Chile. Así lo demuestra el tipo de armamento que utilizan (fusiles M4 y subametralladoras UZI y MP5), sin que se haya declarado formalmente el Estado de Excepción. Según los convenios internacionales firmados por el Estado de Chile, éste debiera ser un territorio mapuche autónomo, en cambio, la colusión política y empresarial lo han convertido en un territorio de ocupación militar, con el objetivo de que la industria forestal siga robando lo que siempre nos ha pertenecido a los mapuche. Así fueron presentados los Dagger en Temuco / Chile . El Gobierno de Chile pretende ‘traer paz’ en tierras mapuche con terroríficos blindados franceses que soportan una ametralladora de 12 mm. Los 12 vehículos de ‘defensa’ están valorados en unos 4,5 millones de dólares, más de 3.200 millones de pesos chilenos. ¿Por qué el Gobierno de Chile invierte en armas represivas en vez de mejorar la calidad de vida de las personas que viven en esa zona? Cuesta creerlo, pero es verdad. El Gobierno ha gastado 4,5 millones de dólares, unos 3.200 millones de pesos chilenos, en la adquisición de 12 vehículos blindados de última generación que aumentarán la represiva militarización en las tierras mapuche, señala el portal chileno El Ciudadano. Este valor supera al costo estimado del hospital de 6.000 metros cuadrados que se construirá en la localidad de Lonquimay, provincia de Malleco. ¿Por qué el Gobierno invierte en armas represivas en vez de mejorar la calidad de vida de las personas que viven en esa zona? ¿Es parte del diálogo o el trato que el Gobierno promete al pueblo mapuche? Las respuestas tienen que ver con que los políticos están protegiendo los intereses del gran empresariado a vista y paciencia de la ciudadanía. En buen chileno: lo está haciendo ‘cara de raja’; es decir, lo que hacen es una desfachatez. Sí, porque el jueves el ministro del Interior, Jorge Burgos, presentó con bombos y platillos en el Grupo de Formación de Carabineros en Temuco cinco de estos terroríficos vehículos acorazados que serán distribuidos en distintos puntos de la región de La Araucanía. El Dagger es un vehículo de apoyo táctico de última generación fabricado por la empresa francesa Panhard, propiedad de la también francesa Renault. Es capaz de cargar una ametralladora de 7,62 o 12,7 mm (montada en un anillo con operador o controlada a distancia), también se puede configurar para lanzar granadas de forma unitaria o múltiples proyectiles, tiene un sistema de gestión de combate, sistema de vigilancia perimetral, puestos de disparo para sus ocupantes (que pueden ser un mínimo de dos y máximo de cuatro uniformados), extractor de humo y sistema para cortar cables. Ademas su blindaje lo protege de minas explosivas, es anticohetes y sus rejillas son anti-RPG7 (el lanzacohetes antitanque). El pasado viernes la presidenta Bachelet salió a defender el polémico acuerdo alcanzado el lunes pasado en la ciudad Atlanta, Giorgia (EEUU) y que involucra a 12 países -incluyendo a Chile- el cual deberá ser ratificado en los respectivos Congresos en un plazo de 90 días. El acuerdo ha generado una amplia critica en los diversos países que suscribieron el acuerdo, incluyendo Chile, esto debido al secretismo y a la participación de grandes corporaciones empresariales que están tras de él. Fue la propia ex Secretaria de Estado de la administración Obama y actual pre candidata presidencial del Parido Demócrata, Hillary Clinton, quien el pasado miércoles en una entrevista salió a rechazarlo y planteó su oposición al mismo debido a los peligros que implica y por que éste no “cumple los estandares que se planteaban”, además que este beneficiaba a las corporaciones farmaceuticas y además no regulaba los manejos cambiarios de las respectivas monedad. Este hecho fue celebrado por los grandes sindicatos en EEUU quienes se han mostrado abiertamente en contra del acuerdo. Bachelet señaló hoy en La Moneda que el acuerdo es beneficioso para Chile y que beneficiaría particularmente a la Agricultura, agroindustria y el sector forestal. Ante las criticas que el acuerdo ha despertado por su secretismo y por los efectos negativos y restrictivos que este tendría con lo relacionado a la propiedad intelectual, la mandataria señaló que “Chile logró acuerdos importantes pero salvaguardando aspectos importantes, como propiedad intelectual“. Así Bachelet apuntó al proceso que ahora le tocará a los parlamentarios quienes deberán ratificar o rechazar el acuerdo dentro del plazo (90 días) que se estableció en el mismo acuerdo, señalando que “le corresponderá al Congreso votar el acuerdo una vez finalizado y suscrito. Estoy segura que primará el interés de Chile“. Mientras tanto este jueves diversas organizaciones y ONG llegaron hasta el Ministerio de Relaciones Exteriores para dejar una carta al canciller y a la presidenta exigiendo que no se ratificara el TPP debido a que este no beneficiaba a Chile y solo impone un acuerdo neoliberal que beneficia a las grandes empresas. Además apuntaron a que el Ministro Heraldo Muñoz mentía al decir que se habían escuchado a las organizaciones civiles y que este acuerdo no cambiaría la normativa y leyes vigentes actualmente en Chile. Aprensiones que aumentan cada vez más en los distintos países y a la que se suma hoy una nueva desclasificación por parte de Wikileaks. El sitio señaló que este capítulo (de Propiedad Intelectual) del acuerdo comercial es el más polémico y controvertido debido a su impacto en los servicios de Internet, los medicamentos, las editoriales, las libertades civiles y las patentes biológicas. En el mismo se revela además que varios ejecutivos de grandes empresas tuvieron acceso completo a este mientras que los mismos representantes negociantes de los respectivos países a penas tuvieron acceso a partes puntuales del acuerdo. 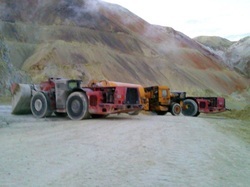 A casi un mes de iniciadas las conversaciones entre dirigentes del sindicato REDPTH CHILENA S.A., buscando mejoras salariales más los respectivos bonos compensatorios, y el enclave canadiense BARRICK GOLD, dueña de la explotación de Pascua Lama, en la frontera de Chile con Argentina, Cuarta Región, Vallenar, los representantes de los trabajadores decidieron tomarse las instalaciones de la faena, ubicada a más de 5 mil metros de altura, con el objetivo de presionar a la empresa para que responda a los requerimientos que se ajustan absolutamente a Derecho. Los trabajadores exigen, entre otras cosas, un trato digno, reajuste en el salario, bono por turnos de noche, un bono anual y otro por término de conflicto. Sin embargo, y pese a que los requerimientos son mínimos, la empresa cuestionada no ha querido responder de manera positiva obligando a los mineros a definir la drástica medida, que culminará una vez que BARRICK GOLD intervenga y medie entre los dirigentes sindicales y los responsables de la empresa. Cerca de 50 son los trabajadores que mantienen la toma en el interior del túnel que une Chile con Argentina, pero 108 son en total quienes a esta hora del día se movilizan en una faena que busca la explotación de oro en este yacimiento, considerado por los expertos como el más grande del planeta tierra. Como es habitual, en estas circunstancias, un grupo importante del aparato represor del Estado (carabineros), viaja desde Copiapó hasta el lugar de la toma con la intención, también como es tradicional, de cuidar los intereses patronales a través de la fuerza y la opresión. My name is Jorge Hurtado I am in house legal counsel at UNITE HERE Local 75 and a member of the Latin American Trade Unionists' Coalition ("LATUC" website: www.latuc.ca) . I am also a member of the Canadian Association of Labour Lawyers ("CALL"). 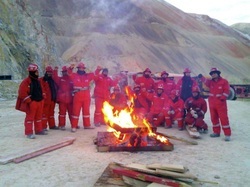 I have just been informed by the CONFEMIN (Confederation Minera) in Chile that the trade union representing miners at REDPATH CHILENA S.A. have gone on strike at the Pascua Lama mine in Chile for better salaries. For those that don't know RedPath is a subsidiary of Barrick Gold, a Canadian mining company. The workers at RedPath I am told have occupied parts of the mine as part of their strike. CONFEMIN has a good relationship with Canadian trade unionists (USWA, LATUC) and are actively working to support the strikers. They need our support. Please circulate the information below. I can draft a letter of support for the strikers that we can present to Barrick Gold. If you are interested in assisting in both the preparation of the letter and supporting the initiative please contact me.